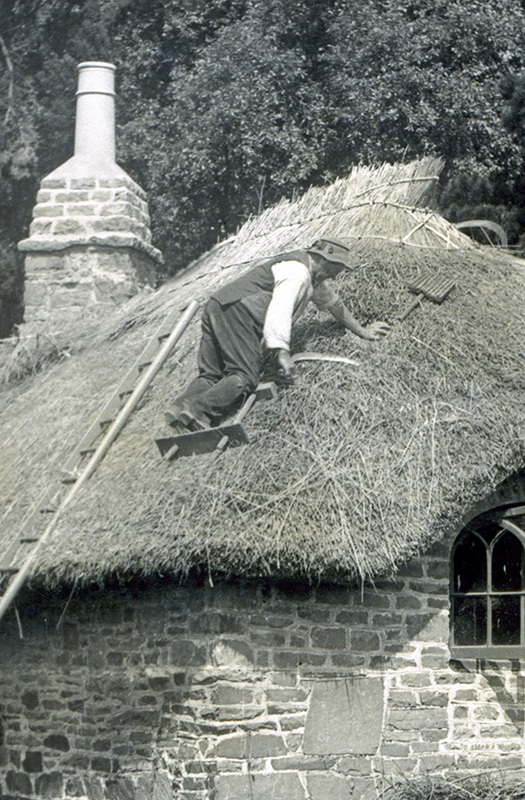 With all the ridging complete; on a new thatch, the thatcher now concentrates on tidying and trimming the coatwork. In a process called Dressing… With the wheat thatches especially, this transforms a shaggy roof, into a clean and immaculate thatch… Each of the main thatching materials are treated in a different manner, to achieve the desired effect. A better finish can be obtained, if the dressing is combined with brushing down the new roof with a stiff broom. This removes any litter between the reeds, and really cleans the roof out. The thatcher taps in any bumps and eases out any dips, as the roof is cleaned. 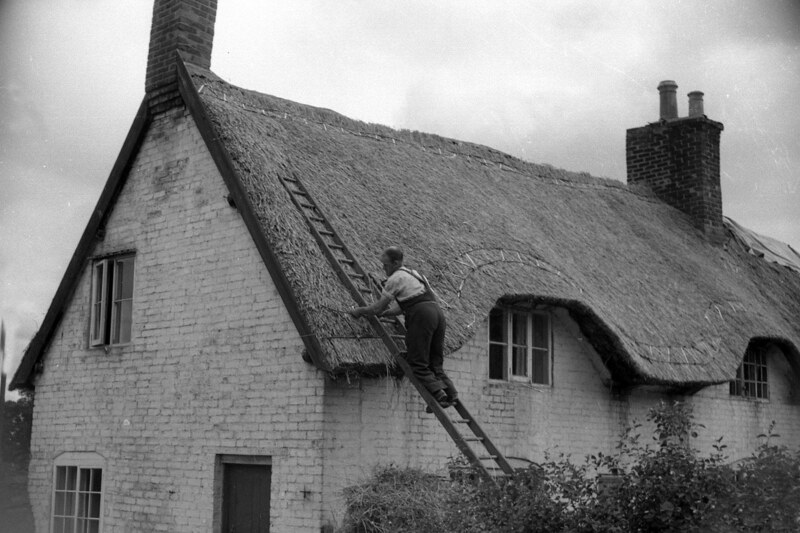 If the material has been fixed properly it is very difficult to move, so the scope for improvement is limited… Another good reason, for the courses of thatch to be laid carefully, in the first instance. All the eaves and gable ends are also dressed into place. Like the main roof, these should be completed as well as possible, when being thatched; so little work will now need doing. There is often some levelling up to do; especially when scaffolding has been removed; and the line of the eaves is revealed, for the first time from the ground. The exact finish, given to eaves and gables, varies a great deal from thatcher to thatcher. 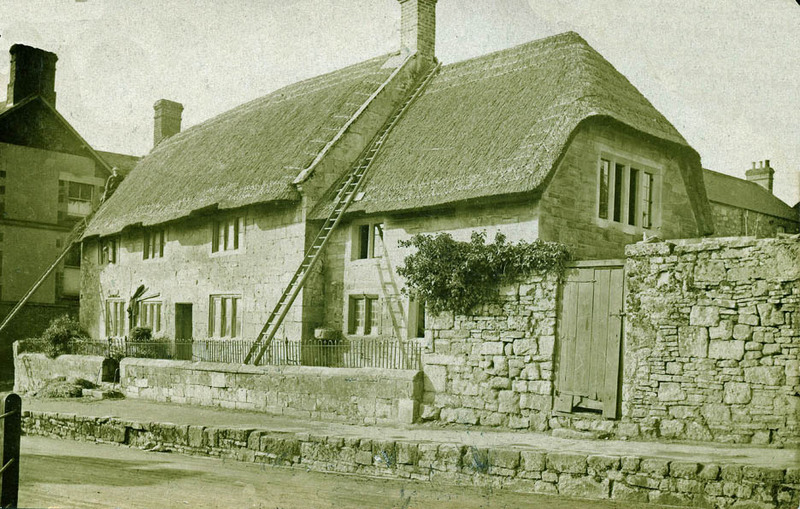 We have seen this gent, in the upper image before , in the section on tools.Now our man shows clearly the shearing action of his hook, at Selworthy, Somerset; in around 1910. Long straw… A comb out and a peg down. The long straw thatcher uses no legget; so there’s no tapping in required. Instead the coatwork receives the attentions of the side rake; in a combined raking and beating action. Any untidy strands are trimmed with a small pair of shears. 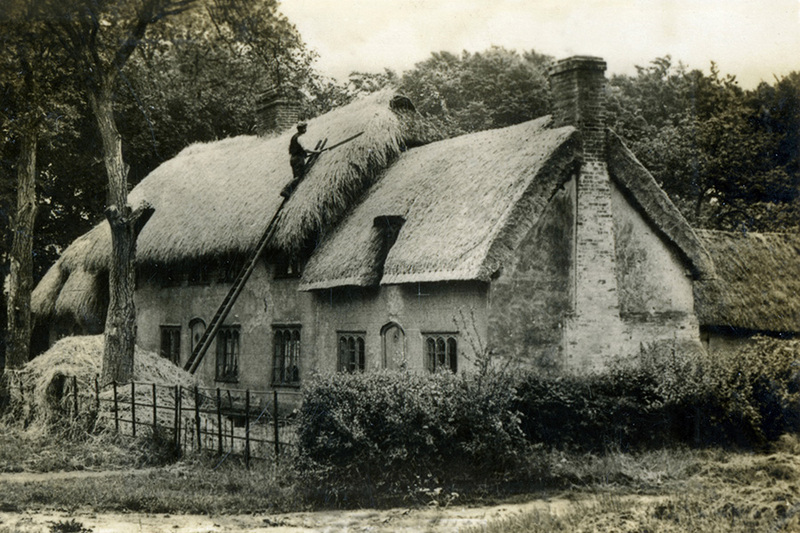 Almost done… The thatcher is now at the far end of his roof, on the Edwardian thatch above. 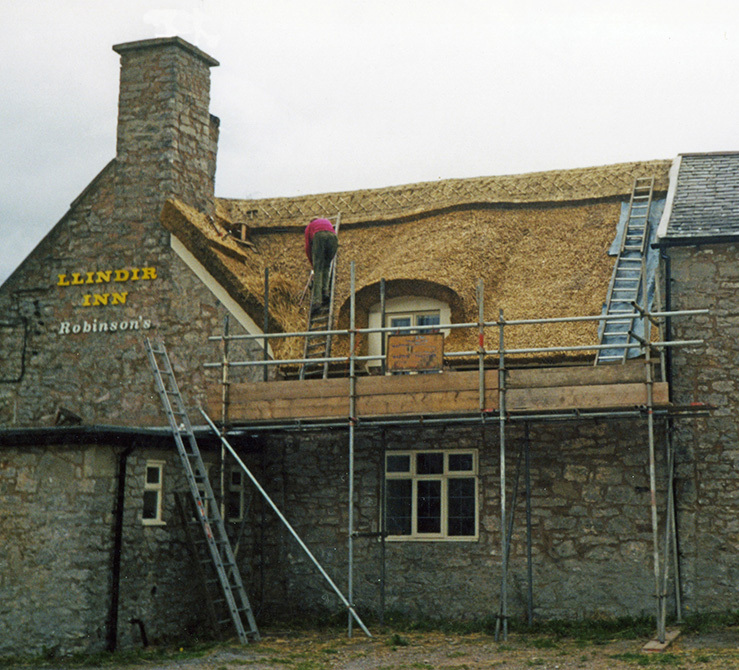 A large amount of sparwork has been used, creating an attractive roof. Note the piece of wood under his unused ladders (Lashed together quite well!). A handy trick, to stop the ladder sinking into the finished roof, creating a mark, which needs yet more work to remove. To cover with wire netting or not? Long straw… With the best will in the world, a roof in this material, will not be so tight as one in a reed thatch… So a tidy covering of wire netting is a good idea. Combed wheat reed… The roof should be tighter than long straw; but not so firm as water reed… So perhaps the gable ends and ridge could be covered. Or if the roof is prone to bird damage, maybe it’s best to cover it all over. 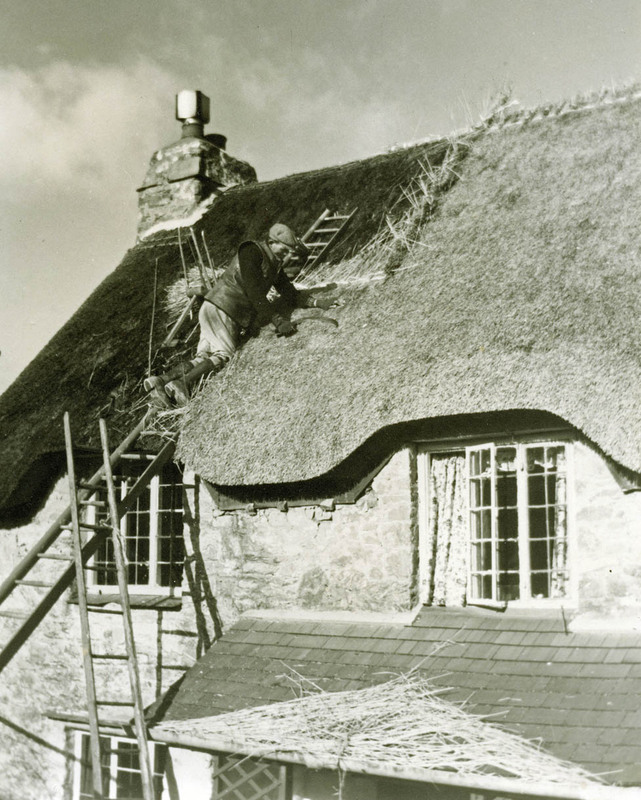 As with thatching, the more complicated the roof shape the longer wiring will take to complete… Wiring should always be carried out with two things in mind. It should be as unobtrusive as possible and more importantly, should be easily removable, in case of fire. The most common method of fixing, is to lay the wire in strips down the roof and join them, by twisting the edges together. The edges should not be twisted too often or too much. The strips can then be removed easily… Care should be taken to lay the wire in a vertical line, as anything else looks awful… Normally, rolls of wire netting 3ft (900mm) or 4ft (1200mm) wide are used, having a 19mm mesh size. The eaves and gable ends should be fixed with similar aims in mind. Spars or wire staples, pushed in between the wallplate and the eaves, give a good result. Wire staples are also the best method of fixing wire, when only the ridge is covered; being almost invisible. ..